In my house growing up, there wasn't much of a way to get out of watching at least the occasional Bollywood movie. With only a few exceptions, they never appealed much to me and I haven't revisited anything not featuring Slumdogs in that genre in years. That is, until SS Rajamouli's Eega came along. After Dark's selection of a Bollywood film (actually, the film is a 'Tollywood' film, meaning that it's of Telugu origin) is unusual, to be sure, but not in any way unwelcome. There's as much fun to be had with Eega as there is in any After Dark festival pick, and it was great to see an audience that often clamors for more gore or kicks to the face get into the film's musical numbers (hey, they're pretty catchy) and saccharine love story. It's definitely the sort of movie that draws you right in as a viewer, with its lush, bright colours, and frenetic action sequences that more than make up for an extremely thin story. I'll say this: despite a sprawling running time of two-and-a-half hours, Eega doesn't feel a second longer than a tight ninety minutes. It's that good. Eega's premise is very simple. Innocent, fun-loving Nani has been wooing Bindu for years, but she remains aloof (though clearly interested). Just as he's on the cusp of getting his advances reciprocated, the wealthy, nakedly villainous Sudeep (in the best and most central role in the film) takes a liking to Bindu and, being unfamiliar with not getting what he wants, becomes jealous and murders Nani. Nani, inexplicably reincarnated as a common housefly, vows revenge on Sudeep and attempts to win back Bindu's heart. The segments involving the fly, all CG, are stunning for Tollywood, based on my experience with the genre, but still a ways back from what's being churned out in modern Western films. Pacific Rim this ain't, but the scenes are all more than serviceable and are used very effectively. The many scenes where Nani the fly has what I can only describe as Rocky-esque training montages to prepare to attack Sudeep had me in stitches, and the 'battle' scenes themselves are very smartly rendered and are actually quite believable. It's certainly rendered in a more competent way than any of the ironically-enjoyed Syfy offerings like Sharknado and the like (faint praise, I know). It's in the fight scenes between Nani and Sudeep that Eega puts its real chops on display. Nani, as a fly, is constantly being dropped (or flown) into very perilous situations where ordinary phenomenon like a dropped cigarette or the footfalls of giant humans around him are Hurricane Katrina-level events. Similarly, as he learns to master his size and newfound skills, the action sequences become even more inventive to show how Nani's actions on the micro level cause catastrophic destruction to Sudeep, his surroundings, and to his overall sanity on a macro level. The perspective shifts seamlessly between Nani and Sudeep and their interplay is as sharp as it would be for two human actors, rather than one human and a fly. When Eega finally wraps, I think just about anyone would be loath to poke holes in its admittedly far-fetched plot and exaggerated performances (a veritable Bollywood/Tollywood trope), because the whole thing is just so damn fun. If you can't derive at least a few laughs from a fly scraping "I WILL KILL YOU" into the windshield of a car he's just managed to cause to crash into a semi-trailer, well, in this reviewer's opinion, maybe it's time to do some serious self-examination. For the rest of us, Eega's one of the most enjoyable, laugh-out-loud theatre experiences of the year. 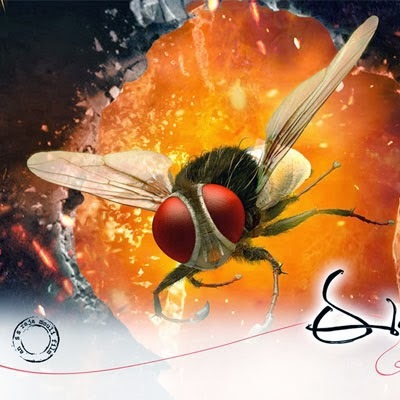 Photo: Nani the fly wreaks havoc in Eega! eega is a telugu/tollywood movie not hindi/bollywood.. remember indian movie doesn't necesarily mean bollywood .. At the most they make 25% of all indian movies! Ah, my mistake - I'll amend my post. Thanks!